For Borgesi, 50, the stakes are not quite as high, but nonetheless very substantial. The volatile South Philadelphia wiseguy has already spent 13 years in prison following his conviction in 2001 in another racketeering case. He was about to be released in March 2011 when he, Ligambi and a dozen others were indicted on new racketeering charges. Denied bail, he has lingered in prison ever since, first awaiting the trial that ended in February and now awaiting the retrial set for next month. A conviction could result in another decade or more in jail. A key issue in the pre-trial motions to be heard at tomorrow's 2 p.m. hearing is how much of the evidence in the first case, which ended in February, can be recycled and used again. Lawyers for Ligambi and Borgesi want the prosecution to be limited in what it can present the second time around. In fact, Borgesi's lawyer, Christopher Warren, argues that his client shouldn't even face retrial, contending that the conspiracy charge against him has no foundation since the jury in the first trial rejected every other count Borgesi was facing. Prosecutors contend the conspiracy law gives them substantial leeway. In effect, they are asking Robreno to allow them to present the same case. It's the legal version of that classic Yogi Berra line: "deja vu all over again." "The government’s witnesses, recordings, and trial exhibits will consist largely of the same witnesses, recordings and exhibits introduced at the first trial," Assistant U.S. Attorney Frank Labor wrote in one pre-trial motion. Hardly seems fair, but it may be legal. Robreno is not expected to rule on the arguments immediately. Most observers believe it is unlikely he would throw out the case. But any ruling limiting the prosecution would be a small victory for the defense on the road to what both Warren and Ligambi's lawyer, Edwin Jacobs Jr., believe will be total exoneration by the jury selected to hear testimony and weigh evidence the second time around. Borgesi was acquitted of 13 of the 14 counts he faced in the jury trial that ended earlier this year. Ligambi was found not guilty of five of the nine charges he faced. The jury hung on four others. Overall, the jury came back with not guilty verdicts on 46 of the 62 counts in the case. It hung on 11 others and issued just five guilty verdicts. Yet four of the seven defendants in that case are now serving substantial prison sentences. The retrial will focus on the racketeering conspiracy charge against both defendants. Ligambi also faces two gambling charges and a charge of tampering with a witness. A third defendant, Eric Esposito, faces a gambling charge. Esposito was not part of the first trial and his lawyer filed a motion this week asking that he be severed from the pending case. "The sheer volume and magnitude of the evidence to be presented against the co-defendants, and the lack of connection of that evidence to Mr. Esposito, would result in substantial prejudice to Mr. Esposito," wrote Kenneth Edelin, Esposito's attorney. Esposito, charged in connection with an illegal video poker machine operation, figures to be a minor player at best during the trial that will focus on Ligambi and Borgesi, two key figures in the Philadelphia mob, according to law enforcement. The two represent two different generations of a crime family that authorities say used fear and intimidation -- including murder and assaults -- to control illegal gambling and loansharking. But the defense at the first trial argued that the reputation of the organization was not reflected in the facts of the case which one defense attorney called nothing more than a "glorified gambling investigation." The conspiracy, authorities allege, began in 1999 and extended through 2011. Warren, who represented mob capo Joseph "Scoops" Licata in the first trial, hopes to come back with another winner the second time around. Licata, 71, was the only defendant acquitted in February. Four others, mob underboss Joseph "Mousie" Massimino, 62, mob capo Anthony Staino, 55, mob soldier Damion Canalichio, 44, and mob associate Gary Battaglini, 52, were found guilty of conspiracy or loansharking charges. Each has been sentenced to substantial prison terms with Massimino receiving the stiffest sentence, 188 months. That would likely be close to what Ligambi and Borgesi would face if convicted by the new jury in the new trial. Borgesi opted to hire Warren to represent him at the retrial in place of his court-appointed attorney Paul Hetznecker. The move could be ripe for legalistic second guessing if the case doesn't go the defendant's way. Hetznecker, who beat back virtually every government charge in the first case, would not have been available for a retrial -- due to scheduling problems -- until early next year. That apparently was one of the reasons Borgesi decided to change horses. Warren has argued vociferously and repeatedly that his client just wants to be treated fairly. 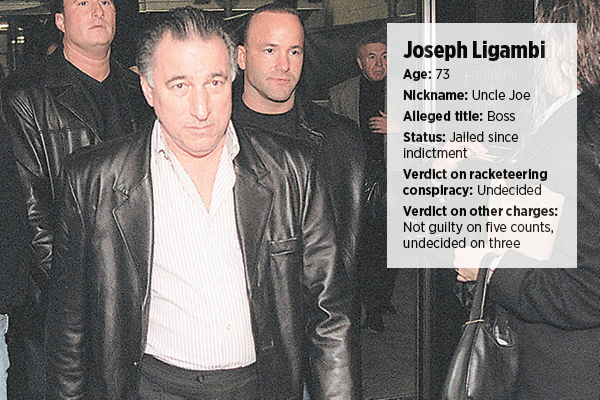 The bulk of the case against Borgesi was built around the testimony of Louis "Bent Finger Lou" Monacello, 46, who said he ran a bookmaking and loansharking operation for Borgesi after Borgesi was jailed in 2000. The fact that the jury found Borgesi not guilty of 13 gambling and loansharking charges tied to Monacello not only discredited the government's chief witness but also undermined the overarching conspiracy charge, in effect gutting the government's case against his client, Warren contends. Why the jury hung on the conspiracy count is one of the many inexplicable developments that came out of the three-month trial and 21 days of jury deliberations. Labor, the lead prosecutor in the case, had likened the jury's rambling deliberations to "wandering in the desert." The panel submitted 30 different questions to Robreno and at times, based on those questions, appeared to be lost. In another pre-trial motion filed this month, Labor has asked Robreno to allow the new jury to have a copy of the indictment with them during deliberations. An indictment was not provided in the last case. Labor argued that the document would be a "guide" and that racketeering conspiracy was "by its very nature a complex charge." Warren, in a defense response, said the jury should be permitted a copy of the indictment provided the multiple counts (46) for which not guilty verdicts were delivered in the first trial were redacted. That, as he has contended in a series of pre-trial motions, would leave very little, if anything, to support the racketeering conspiracy charge against his client. Both Warren and Jacobs contend that their clients are being retried unfairly and in effect have to "run the gauntlet a second time" on charges for which they have already been acquitted. trial," Warren wrote in arguing that the prosecution should be limited in what evidence and testimony it could use this time out.